Plan optimal routes or chart your own course using weather, elevation, curves and more. Then navigate safely with voice-guided, turn-by-turn directions that automatically check your route for severe weather. Test all features free for 7 days. ***As seen on the TODAY show in the Traveling This Summer segment*** “adding to both the safety of the ride and the pleasure of knowing beforehand what to expect” - Florin Tibu, “autoevolution” “I used InRoute for planning six world record attempts. 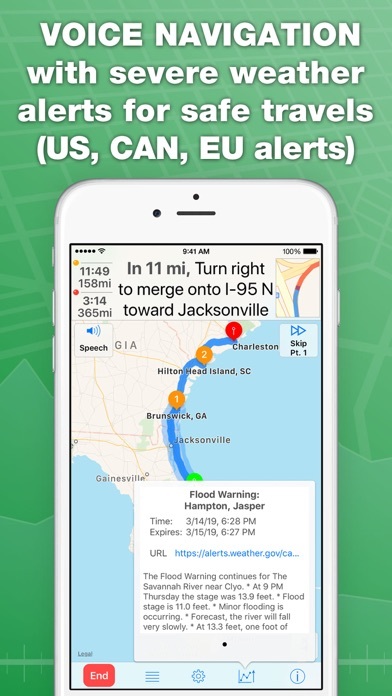 No weather app gives you more information, period.” - Carl Reese, Multiple World Record Holder Key Features (some require in-app purchase--see below): • Voice guided navigation of up to 150 locations with automatic severe weather alerts (alerts are currently available in the US, Canada, and EU) • Optimize waypoint order for fastest time, or manually reorder • Import from XLSX, GPX and KML files • Create custom routes based on weather, elevation and curviness, or build your own route from available alternates on each leg of a route • Interactive charts showing route elevation, curviness, weather (temperature, humidity, precipitation, wind speed/direction, severe weather alerts), and sunrise/sunset times • Search along a route—the whole route, every x miles/hours, or the next x miles/hours from a place—find gas, hotels, campgrounds or places to eat close to a route • Set Departure and Layover Times—weather forecasts, road conditions (e.g. 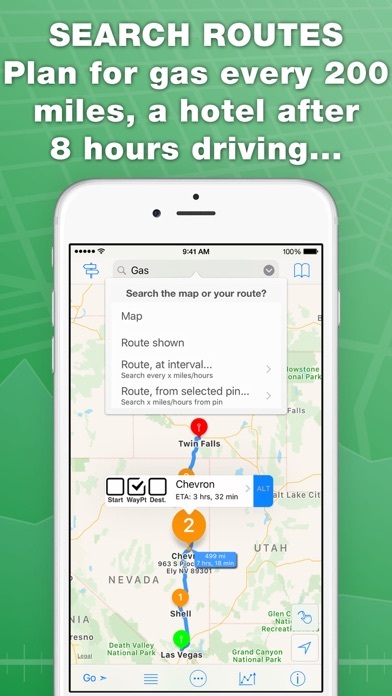 congestion), and travel times accurately reflect conditions throughout the trip • Save your favorite routes and places, sync between devices, organize into folders, print via Airprint, and share with family and friends • Easily add places to the map using a Dropped pin, Search, or Contacts • Export routes to Apple Maps, Google Maps, Navigon, and Waze. Some apps use inRoute's "Agenda Nav" feature. 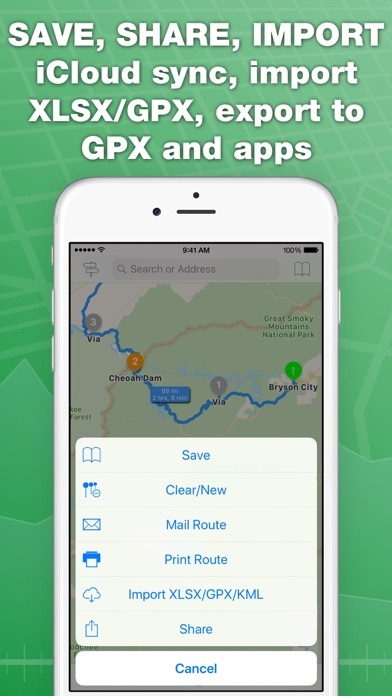 See the in-app FAQ for more info • Export to GPS devices and apps compatible with GPX files • Routes are stored on your device so you can access them even if you lose connection The following are available after in-app purchase. 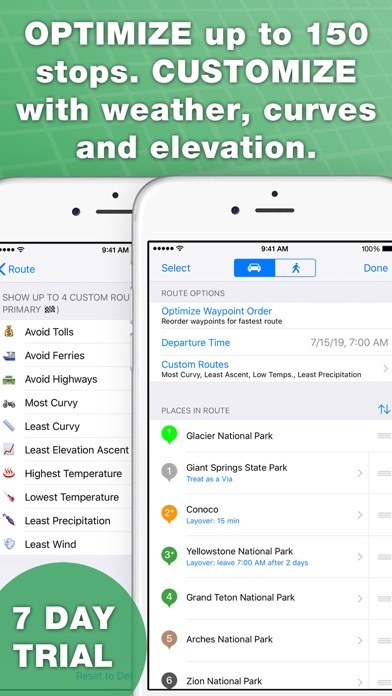 - Add more than 5 places per route, weather and elevation charts/custom routes, voice navigation, iCloud sync, export, layovers, advanced route search - For additional details, see the in-app Upgrades screen Two purchase levels. Test 7 days for free. 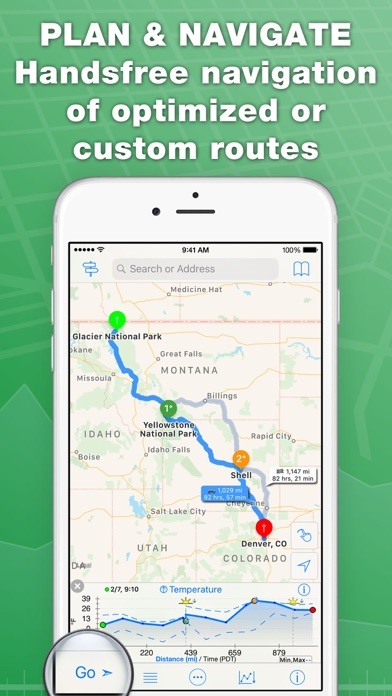 1) inRoute Pro: $3.99 monthly, or $29.99 annually. Create routes with up to 150 locations and access all services. 2) inRoute Premium: $14.99 one-time purchase. Create routes with up to 25 locations and access all services. Price may vary by location. Subscriptions will be charged to your credit card through your iTunes account. Your subscription will automatically renew unless canceled at least 24 hours before the end of the current period. Manage your subscriptions in Account Settings after purchase. Note: Since continued use of GPS running in the background can dramatically decrease battery life, inRoute will automatically shut down if you haven't used it in a while. I’ve tried many route planning apps over the years and inRoute is by far the best I’ve experienced - I say this after using it for about 10 miles. It’s simple to use, it’s never once crashed or frozen on me while I’m riding, and it’s completely hands-free during navigation. If you’re looking for a full featured, intuitive app to plan your two-wheeled adventures, this is it. App says it supports family sharing but it does not. You are forced to purchase for every family member. False advertising. To add additional comments in response to the developer comments (which are appreciated): 1. Without going into detail, if you wanted to allow for sharing of the paid version, there are many technical solutions to be able to do this. 2. If you never had intention to allow sharing of paid benefits, might I suggest you remove the “Family Sharing” compatibility from your “free” app, unless the goal is to cause confusion amongst consumers. Yes! Exactly what I was looking for. I have tried a two different routing apps in the past and I have to say this one has all of the features I was looking for. I was specifically looking for an app with the ability to move onto the next waypoint without any user interaction and this does just that. Working for a large parcel company, this app really comes in handy and maximizes efficiency on the road. It lets you know the distance to your next stop, as well as total distance to your ending stop-which is really great for planning your day. The price you pay for the features you get is beyond worth it. I can add waypoints and plan my route in advance, but the app is horrendous when it comes to implementing the route on a trip. The UI is terrible, it's not easy to use. I really want to find something better. I do a lot of overseas motorcycle trips and I plan all my routes via inRoute. I spend weeks planning the perfect routes. I’m looking for scenic curvy routes all over the mountains and the app allows me to see elevation changes and curviness of the route while I’m planning. I also take photos during my rides and I want to be at specific locations on my ride during sunrise/sunset and the app shows me sun up/down along my route and where I’ll be when it happens. While I’m on my ride, I check this app all the time to determine weather conditions along my ride. Incredible! This app rocks!!! The one essential feature that I need that has caused me issues during route planning is the inability to set the time zone for start-times of my routes. I always have to do mental Olympics while planning my route to determine what time local is the desired time at my route start point halfway across the world. To complicate things further I travel every week and so my local time zone changes during my route planning sessions and it screws up my start-time offsets for my route location start. Having the ability to set timezone, or even better, automatically determining timezone based off the location of the route start point would be fantastic. I really really want to give this app 5 stars but can’t without this critical timezone feature. I have RVed for a decade and use this app more than any other app for planning my trips. It is completely useful, the learning curve is not that difficult, and if you pay for it, your can use it as your map while traveling. You can’t go wrong with this app, trust me, as it has really given me confidence to plan longer and more complicated trips. I know before hand, elevation ascents, curviness of roads, and the projected weather. Do yourself a favor and get it, use it, and enjoy the open road. This app is excellent for RV’ers! Being able to see the elevation changes and the amount of “curviness” along the route is a game changer in route planning! I love this app. My husband loves that you can pick a curvy route for when he is on his motorcycle. My only but is I want an RV (recreational vehicle) option. We spend a lot of time traveling with our RV and to be able to put the night of our rig in a trip planner and have it route avoiding low bridges and roads RV are band on would be great.